Alejandra is a Geographer from the University of Chile (2006) and holds an MSc. in Environmental Monitoring, Modelling and Management from King's College London (2012). From 2013 to 2017 she worked as a lecturer in Universidad Católica de Temuco, Universidad Academia de Humanismo Cristiano, Universidad Austral and Universidad San Sebastián in Chile, teaching courses related with GIS, Remote Sensing, Oceanography and Introduction to Geography. Her interests focus on environmental monitoring with satellite images, cartography and GIS. 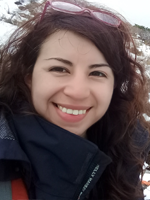 Alejandra's research concerns the biogeography of giant kelp forests, an ecosystem extending along the temperate coastlines of the Southern Ocean and the west coast of North America. Specifically, her research is about a) mapping the global coverage of this ecosystem, b) understanding the abiotic factors and patterns of the presence of kelp forests c) exploring the differences between kelp forests in different ecoregions and landscape units, and d) monitoring the seasonal and long-term fluctuations of kelp for each ecoregion. This research has its focus in the southern coastline of South America. She also has a long-standing interest in the natural and cultural landscape of Patagonia, contributing regular articles on this territory to the online magazine Aura Austral. Armesto, J.J., Manuschevich, D., Mora, A., Smith-Ramirez, C., Rozzi, R., Abarzua, A.M. and Marquet, P.A. (2010) From the Holocene to the Anthropocene: A historical framework for land cover change in southwestern South America in the past 15,000 years. Land Use Policy, 27(2): 148-160.